Temper tantrums are as difficult for children to deal with as they are for those around them. Children scream and loose control because they cannot have their own way. You may feel angry, frustrated or even scared. You may wonder what you have done wrong. Rest assured, almost all youngsters have tantrums between the ages of one and three years. 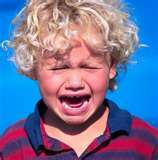 Tantrums are a normal part of growing up and they will stop before the age of four. If your child has angry outbursts after that age you should call our office for an appointment or seek an evaluiation with a psychologist experienced in evaluating children. Young children are eager to take control. They want to be independent and they want to do more than their skills and safety allow. They also want to make their own choices and do not cope well with disappointment or restraint. Some temper tantrums are for attention; others are to avoid doing something or to protest not having their own way. Tantrums are a child’s way of showing frustration and anger. Children of this age sometimes cannot fully understand their parents and other adults. They do not know all the words needed to describe their feelings and needs. Also, they have not yet learned to solve problems. Instead, they act out their anger and frustrations by crying and screaming, thrashing and head banging, breath holding, breaking objects, or being mean to others. The following are examples of mild temper tantrums that can and should be ignored: crying and screaming for attention, whining to get attention (some find it helpful to say, “I can’t understand you when you are whining. Please talk in a normal voice”). Minor displays of anger can include slamming doors, sticking out the tongue, or making faces, or pounding or kicking the floor, wall or door. Temper tantrums are like safety valves that let off steam when the pressure gets too high. Parents need to accept that temper tantrums are a result of the child’s inner struggle in growing up. They are normal and an expected part of a child’s development. When your child has a temper tantrum, try to remain calm. If you are loud and angry your child will copy you. Shouting at them to calm down may make the situation worse. Stay peaceful. Most of all, do not get upset or angry with your child or hit or spank them. Temper tantrums should be ignored unless your child is damaging things. In a public area it is appropriate to remove your child as a courtesy to the people around him or her. Some temper tantrums are too violent for parents to ignore. When this happens, children should be taken away from the scene of the tantrum to another room. A parent should stay with them. These types of temper tantrums include such behavior as: hitting or kicking parents or others; throwing things; continued screaming or yelling; and having tantrums in public places. Consult me if your child shows any of the following signs: Tantrums continue or get worse after age four; injures self or others; destroy things during tantrums; has frequent nightmares; loses toilet training skills; frequent headaches, or stomachaches; clings to parents; displays persistent negative moods.